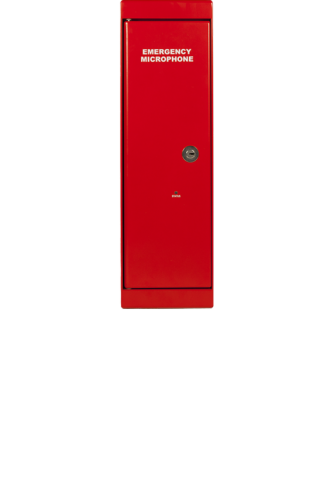 The EAP01 Emergency Announcement Point is housed in an IP65 vandal resistant, lockable wall-mounting box. It is designed to work with the whole range of ASL Voice Alarm and Public Address systems, and is normally used for making All-Call emergency announcements to entire facilities. The unit features indicators for ‘Busy’, ‘Speak Now’, and ‘System Fault’, together with a ‘Status’ indicator. The EAP01 will operate in an All-Call mode even in the event of processor failure within the Router1, as required by BS5839 Pt.8. The unit should be connected to Router’s inputs 1 or 2, which operate in the All-Call failsafe override mode in the event of processor failure. Router, while microphone audio is provided as a balanced 0 dBu (nominal) analogue signal. The EAP01 features a built-in signal limiter to accommodate varying operator technique. The microphone’s processor is responsible for generating an outgoing 20 Hz surveillance tone which is used to monitor the audio connection to the Router, while microphone capsule monitoring is performed by injection and monitoring of a signal such that either open or short circuit of the capsule or associated wiring will indicate a fault.